LOS ANGELES, California, November 16, 2010 (ENS) – When Joel Ewanick meets the press for previews of the Los Angeles Auto Show on Wednesday, the General Motors U.S. marketing vice president can be confident in the performance of his company’s new electric vehicle on display at the show, the Chevy Volt. Last night Ewanick arrived in Los Angeles in a Volt after a 2,394 mile trip from GM’s Detroit headquarters that took 4.5 days and crossed 10 states. The Volt begins production this month at the Detroit-Hamtramck Assembly Plant. California is one of the Volt launch markets, along with New York City and Austin, Texas. California customers will be among the first to receive their Volts, taking delivery in December. The Volt gets 25 to 50 miles on a single electric charge before a gasoline-powered generator provides electricity to power the wheels for an additional 300 miles. Ewanick was accompanied by a crew in a second Volt carrying Lane Rezek, a Voltec powertrain development engineer, who brought along some testing equipment to get on the road data on the Volt’s 16 kwh battery, beyond the million miles of development driving already done. They traveled at highway speeds almost exclusively and sometimes up to 80 mph, the legal speed limit in Utah. 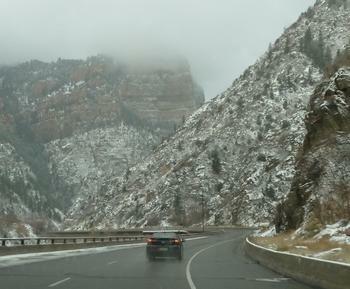 They encountered snow in the Rockies, a time to use the Volt’s built-in Mountain Mode. 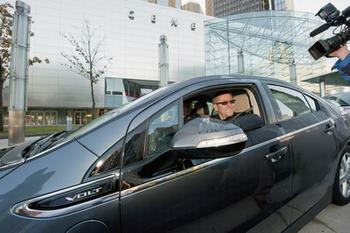 In extended range mode, the Volt got from about 36-43 miles per gallon, said Ewanick. The Los Angeles Auto Show runs from November 19 through 28. Over 1,000 of the 2011 makes and models of import and domestic cars, including several world and North American debuts, as well as 50 alternative fuel and electric vehicles will be on display. Three alternative fuel and electric vehicles will debut at the Los Angeles Auto show. The South Korean car company Kia will introduce a hybrid version of its Optima midsize sedan at the Los Angeles Auto Show. Toyota Motor Corporation will unveil the RAV4 EV concept, an electric vehicle it is developing jointly with Tesla Motors, Inc. The RAV4 EV concept, based on the Toyota “RAV4” compact SUV body and fitted with a Tesla electric powertrain, is aimed at commercialization, with launch in the United States planned for 2012. Nissan will debut the Nissan Ellure concept car and will also give show attendees a first look at the production version of the 2011 Nissan Leaf, the all-electric, zero-emission car rolling off production lines this month. In October, Nissan started production of the Leaf at its Oppama facility. The new EV is slated to go on sale in December in Japan and the United States, and from early 2011, in selected European markets. In November, the company will begin exports to the United States, followed by shipments to Europe in December. Sites for future production of Nissan EVs include Smyrna, Tennessee, and Sunderland, England.